Many thanks to those who make this possible; our supporters, volunteers, and parents! Samuel Sentmanat began studying the violin at age ten with Houston Symphony violinist Michaela Oancea-Frusina. Later he worked with Dr. Joseph Cease, a career Hollywood studio musician and retired professor of musicology from the University of California at Berkley. He has directed groups such as the William Byrd string program and Chamber Singers with Mr. Lawrence, (see below). Mr. Sentmanat specializes in Baroque and Renaissance music and in addition to his work on strings, has a passion for sacred music and maintains choral groups. Teresa Sentmanat has been studying viola for 10 years. She was a student of Mr. Edward Lawrence and a member of the William Byrd Chamber Ensemble for 5 years where she met her husband, Samuel. She now works alongside him as an accompanist, teaching viola and bowing technique. Edward Lawrence was an active performer on the violin, viola, violoncello, and piano. He attended the Eastman School of Music where he was a scholarship student of the renowned piano pedagogue, Mme. Cécile Genhart. He then completed a degree in music theory at the University of Texas at Austin, where he also received a performer’s certificate in ‘cello performance with Professor Phyllis Young. He was a member of the Austin Symphony Orchestra, the Orchestra of Santa Fe, New Mexico, and the Houston Ballet Orchestra. For two seasons he served as the music director of the Arius Chamber Players, a touring string ensemble based in Austin, Texas. He developed much of the pedagogy that aided the formation of our music program. Mr. Lawrence maintained a private lesson studio at his home until he passed away on Ash Wednesday, February 10th 2016. Ferenc Illenyi is a native of Hungary where his first teacher was his father, a violinist with the Hungarian State Opera. He made his debut in Budapest performing the Beethoven and Tchaikovsky violin concertos. He has performed recitals in Hungary, Germany, Switzerland, Canada and the United States, and has recorded works by Paganini, Saint-Saens and Schubert for Hungarian radio and television. 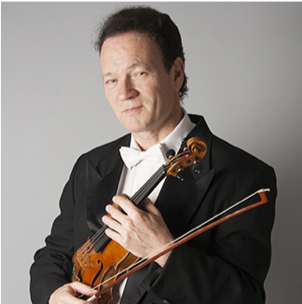 Ferenc has a master's degree in music from the Liszt Music Academy in Budapest and has been a member of the Houston Symphony since 1991.